The Pensione Seguso is a two-star hotel for Venetophiles who love tradition. It's cozy and old-fashioned, with antique furniture and an atmosphere that probably hasn't changed much since a British diplomat converted the 16th Century building into a hotel before World War I.
Bathrooms are down the hall, so stay elsewhere if you can't live without your own WC. As you leave the Alilaguna Linea Blu floating boat pier, turn right and walk a short distance along the Giudecca Canal waterfront. In less than a minute, you'll see the Hotel Calcina on your left, a restaurant terrace on your right, and a stone bridge up ahead. 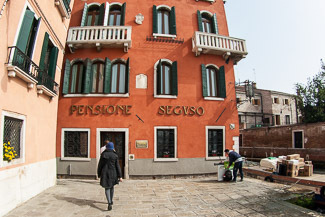 The Pensione Seguso is just around the corner before the bridge, facing the Giudecca Canal behind a small square. Cross the bridge and continue walking along the waterfront, past the vaporetto stop and the Billa supermarket. When you reach a stone bridge (the Ponte Lungo), cross it and keep walking straight ahead past two churches. You'll find the Pensione Seguso around the corner from the Hotel Calcina, immediately before the next stone bridge. Take the Alilaguna Blue Line airport boat from the cruise basin to the second stop (Zattere). The price will be about half of the fare to the airport. Get off at the Zattere stop and follow the directions above.